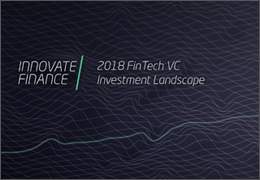 2018 was a record year for the FinTech industry, according to Innovate Finance’s ‘2018 FinTech VC Investment Landscape’ report. Last year saw $36.6bn of venture capital (VC) invested in the sector across 2304 deals – a 148 percent increase from 2017 and a 329 percent increase over five years. VC and private equity (PE) investment in the UK’s FinTech sector reached record levels in 2018, up 18 percent year-on-year to $3.3bn. PE investment rose 57 percent to $1.6bn, while venture capital dipped to $1.7bn, ahead of its peers in Europe. VC investment into FinTech in both China and the US overshadowed and outpaced all other global regions, however. Of the top 15 deals in 2018, over half occurred in the US and a third in China. Combined, China and the US accounted for 80 percent of the world’s 15 largest deals. China led the way, with $18.9bn invested across 90 deals. The US was the most dynamic and mature market, with $10.6bn invested across 1042 deals, a 52 percent increase in capital invested year-on-year. The UK’s FinTech sector ranked third. Within Europe, the UK continued to dominate, though Germany in second place on the continent saw $716m invested across 48 deals, with third placed Switzerland attracting $328m invested across 40 deals. 2018 was also a notable year for a number of challengers and banking platforms, including Revolut, Monzo and SolarisBank, among others, which raised record amounts of capital.